For me, Ghostbusters is in the same boat as Predator, Die Hard and Gremlins: the second is more entertaining than the first. 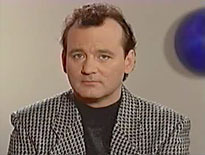 No longer an accredited Ghostbuster, Dr. Peter Venkman becomes the host of the truly awful "World of the Psychic" program. Thankfully his reality television career ends about as quickly as it began. World of the Pychic may have sucked, but it was better than what Ray and Winston were doing for money: driving Ecto-1 around town and performing at kids' birthday parties. He may have been a fraud, but at least he he was a proud fraud. And besides, it's not like he's the only one: one of his guests was supposed to be a telekinetic who could bend spoons, and that guy's a bigger charlatan than the Stupendous Yappi! Peter is wearing his stylish jacket, though it's just grey, since there's no way to reproduce the film wardrobe's houndstooth pattern. He has a dark shirt and pants, and his brown shoes have red laces. That's an incredibly small detail, but it's accurate to the movie, so huge points to Art Asylum. We said before that Minimate Venkman has the best face of the bunch, and nothing's changed here: it's still terrific! Other than not having a nose, the likeness is spot-on. The expression is trademark Bill Murray "bored smarm," a sort of nonplussed glance at the camera that he perfected years before Jim showed up on The Office. If only there were a way to make his hair both fluffier and thinner, this would be perfect. "World of the Psychic" Peter has, in addition to an overly long and complex name, has an accessory: not a proton pack, something new; something that's never been seen with a Minimate before. The next episode of World of the Pychic was going to be about the weirdness of hairless cats, and the figure comes with one. There's never been any kind of Minimate animal before [Gollum's fish doesn't count? --ed.] 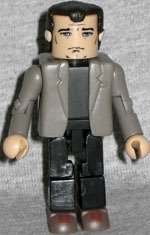 - we're one step closer to a Minimate Dr. Evil! This hideous little monster is designed to rest on Peter's arm. The ancient sorcerer known as Vigo the Carpathian terrorized his people and promised to return one day to finish his tyrannical rule. Powered by psychomagnotheric slime, his powers almost rival those of Gozer. Yes, "almost." Almost, but not quite. And when he wasn't powered by psychomagnotheric slime, he's much weaker. Think of it like a trampoline: you can use one to jump high, but Michael Jordan can do the same thing without one. In the ghost world, "mood slime" is a performance-enhancing substance. Vigo's full name is Vigo von Homburg Deutschendorf - named after the actor who played him and the twins who played baby Oscar. He was voiced by everyone's favorite sinister Swede, Max von Sydow. Sadly, Vigo does not come with a mountain of skulls, the castle of pain, or the throne of blood. Rip-off! On the other hand, his 16th century tunic/armor dealie is all new and heavy with details. The body of the suit is all one piece, with the gloves and boot-fronts adding additional brutal fashion. 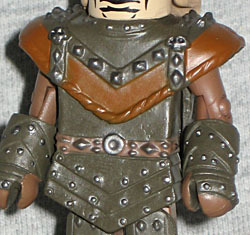 I would have loved loved loved it if we'd gotten a "Minimate-ized" version of his portrait as an accessory, but maybe there were licensing issues preventing that. The figure has two faces: the comparatively normal head, with its thick lines and separate blonde hairpiece, and his more demonic head, with its lumpy forehead and small red horns sprouting from the temples. Since the demon head is just a large, ornate cap that fits over a standard Minimate noggin, you can give it to other figures. Say, if you wanted to show Ray possessed. 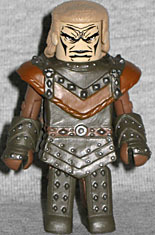 Vigo is as important to the second film as Mr. Stay Puft was to the first, so it's great that they've given him the Minimate treatment. The newest series of TRU-exclusive GB Minimates isn't quite plentiful yet, but the good news is Peter and Vigo are fairly plentiful in the assortment. Still, given this line's track record, best to get 'em as soon as you see 'em.